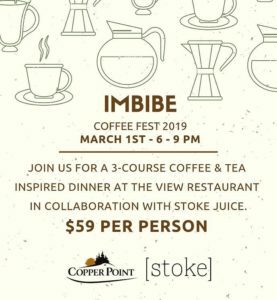 Join us for a 3 course coffee and tea inspired dinner at The View Restaurant at Copper Point Golf, Friday March 1, 2019. We will be kicking off Invermere’s own Coffee & Tea Fest with cocktails infused with coffee, tea, and Stoke Juice’s own cold pressed juice and nut mylk creations. Let the chef tantalize your taste buds with this innovative 3 course dinner where natural tea and coffee flavors permeate through every bite.